/ Modified jul 18, 2013 4:39 p.m.
Michael Schwartz is an artist, and the executive director of the nonprofit organization known as Tucson Arts Brigade. Schwartz says TAB provides civic engagement opportunities through the arts. 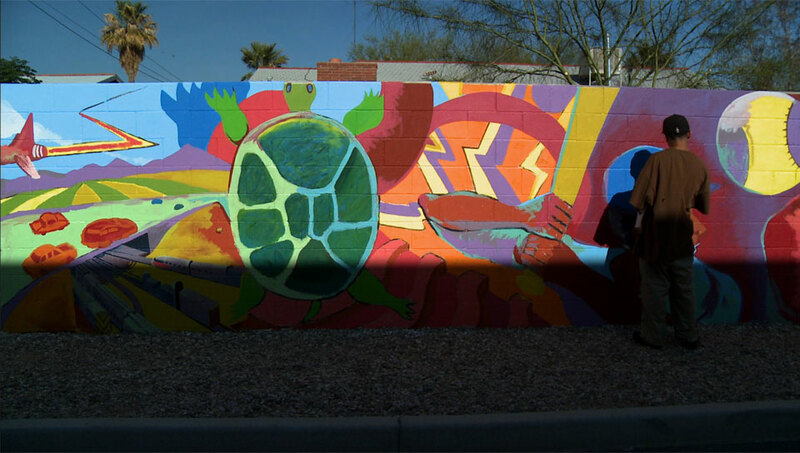 Josh Jacobson owns a Lucky Wishbone restaurant adjacent to the Tucson Arts Brigade Mural in the Barrio Centro neighborhood. He says the mural is more than just a beautification project; it plays an important role in strengthening the community. Schwartz says the history of the neighborhood is depicted in the Barrio Centro mural and serves as a catalyst for community involvement. Students interviewed neighborhood elders and used their information in the design process.